The UN calls on the Saudi-led coalition to secure “safe and reliable” access to Yemen’s Sanaa International Airport. The Saudi Foreign Minister reveals the coalition is considering specific truces to allow humanitarian aid to reach Yemen. 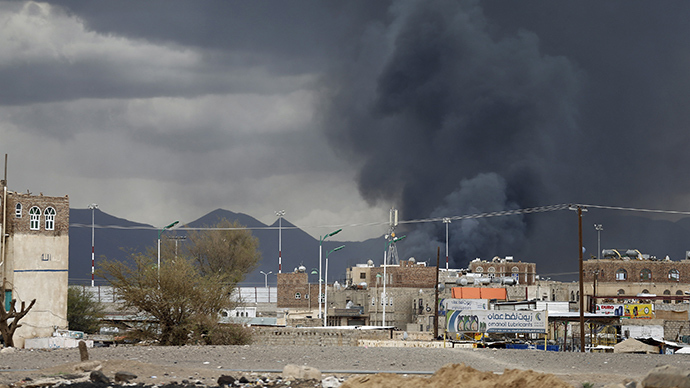 Promoting the aid operation in Yemen, the United Nations urged the Saudi-led Arab alliance, which is carrying out airstrikes against Houthi rebels, to stop bombing the capital’s airport, said the UN relief coordinator for the country on Monday. “Without access to the airports, aid agencies are unable to bring in staff, vital supplies of medicines and other critical life-saving assistance, or undertake medical evacuations of their personnel,” Johannes van der Klaauw said. “I strongly urge the coalition to stop targeting Sanaa International Airport and to preserve this important lifeline – and all other airports and seaports – so that humanitarians can reach all those affected by the armed conflict in Yemen,” the UN official added. Earlier on Monday, the Saudi FM Adel al-Jubeir said the coalition was considering calling truces in some areas of the country to let humanitarian supplies reach the country, Reuters reported. “The Kingdom of Saudi Arabia is holding consultations with members of the alliance in defense of legitimacy in Yemen and all countries that support it, to create specific areas inside Yemen to deliver humanitarian supplies, where all aerial operations will stop at specific times to allow these supplies in, as stipulated by UN Security Council resolution 2216,” Jubeir said in a statement. According to the resolution, the Houthis and their allies are to disarm and leave captured cities. It also imposes an arms embargo on the group. His words were followed by Yemeni President Abd Rabbuh Mansur Hadi’s announcement that talks are to be held beginning May 17 in Riyadh, the Saudi capital. According to the UN Office for the Coordination of Humanitarian Affairs (OCHA), the last week’s strikes by the coalition rendered it impossible for airplanes to take off or land on the runways of the airport. The conflict has taken lives of more than 1,200 people, and over 300,000 have fled their homes since it broke out in March. The humanitarian operations from abroad, including aid agencies, have been struggling to provide assistance to the Yemeni communities, due to fuel shortages and the fact that large areas of the country, as well as Sanaa, are contested between the Houthi rebels and the forces loyal to Hadi.